Believe it or not, Jigsaw has been a part of the British high-street scene since the '70s. But this season, we are taking extra notice of the luxury clothing label. The brand's womenswear generally offers a more mature selection than say, Zara, yet pieces are still trend-led with eclectic twists. Fashion insiders pricked on the release of its most recent spring/summer 2018 collection, which the brand says is "a look back at 1960s psychedelia." Our favourites from this season include a rainbow pleated dress, a contrast skirt and a blush trench. In short? You shouldn't be bypassing Jigsaw this year. Keep scrolling to see our favourite pieces from the brand's latest collection. 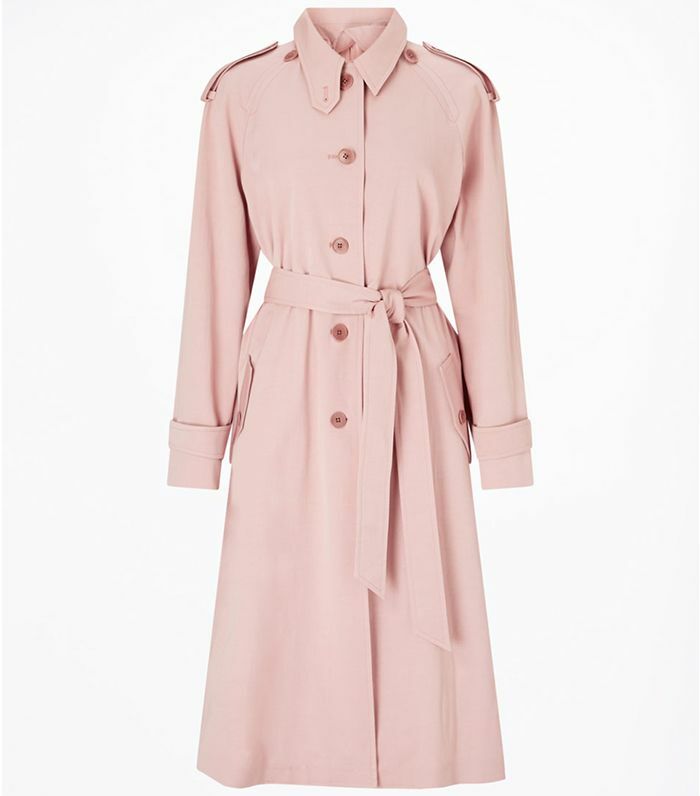 We're all for swapping neutrals for a blush-pink trench this spring, and this one has got our name on it. When still, you'd think this was a simple navy dress, but when you give it a swish, it's a rainbow treat for the eye. Perfect. Shoulder-grazing earrings always get a yes from us, and the smooth sheen on these makes us want to touch them. Can we? This soft, button-down leather jacket is perfectly classy with a hint of edge. It's worn best with a simple spring dress or straight-leg jeans and a tee. We can see these block-heel pumps becoming our everyday work shoes. This style also comes in bright orange and yellow. The punchy orange contrasted against black in this pleated skirt is so cool. Babouche flats are having a moment right now, with countless brands making their own Moroccan-inspired versions. How happy does this orange pair look? We can see this ruffle-neck top paired with some washed-out denim and the aforementioned navy block-heel pumps. The spotty theme continues with this incredible pair of wide-leg trousers. Need.